The Grand Chapiteau, Entertainment Quarter, Sydney, October 28. 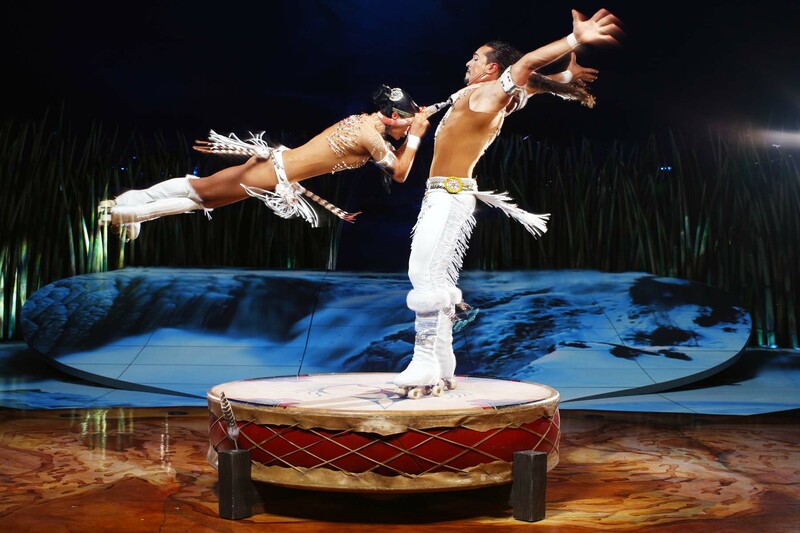 THE theme of Cirque du Soleil’s Totem is nothing less than the progress of the human race. The show begins with the thrilling sight of a man descending from the highest reaches of the vast Cirque tent, his mirror-encrusted bodysuit catching the light as he swirls in space. Beneath him a group of sleekly reptilian figures chants and swarms. The distant future and distant past meet. Or something like that. It’s a creation story akin to that in the film Prometheus – visitor from another planet sparks life on earth. As is the case with all Cirque du Soleil shows, a broad and malleable idea is used to develop a striking visual identity and loose through-line. Underneath everything is pretty much the same: the acrobatics, the juggling, the aerial displays and other traditional acts of skill and daring, performed by the best exponents in the world. Cirque cast lists are a mini United Nations. 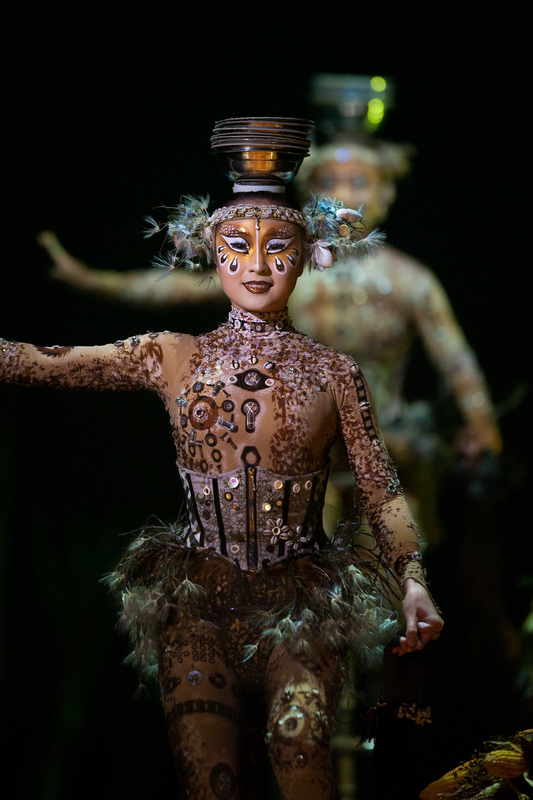 This ability to marry time-honoured circus thrills with high-end production values has made Cirque an international entertainment juggernaut that this year celebrates its 30th anniversary. How many times can you put old wine in new bottles? Endlessly, it would appear. Cirque has 19 different shows on the go at the moment, nine of them in permanent residency primarily in Las Vegas. It’s a long way from the small Canadian town where Cirque had its origin as a group of street performers. For Totem’s image-making Cirque went to celebrated Canadian director Robert Lepage, a deserved darling of international arts festivals (The Seven Streams of the River Ota, Needles and Opium, The Far Side of the Moon, Lipsynch and more) and a noted opera director. New York’s Metropolitan Opera went to him for its most recent Ring cycle. Lepage has a fertile imagination but can impose only so much coherence on an episodic form. What do five supremely accomplished and delightful young Chinese women who catch bowls on their heads while riding tall unicycles have to do with the evolution of humankind? Apart, of course, from the fact they are clearly much more highly perfected physical specimens than you or I? Apparently they represent Mother Earth’s “ultimate balancing act” in providing food from season to season. Best to ignore the over-blown explanations provided in the program and go with the moment. Lepage’s scenario jumps from the primeval ooze (gymnasts on high bars) to muscly blokes on a beach (Roman rings) via American First People (small hoops) in the blink of an eye. Science (various acts of manipulation) jostles with romance (fixed trapeze duo, roller-skating pair). The earth’s mineral wealth finds a frankly bizarre correlation in two women who foot-juggle squares of fabric weighted with sparkly bits, but Marina and Svetlana Tsodikova were certainly spectacular. I was slightly taken aback, however, when Crystal Man, he who set in motion the evolution of life on this planet, was lowered from the heights a couple of times to pick up a chair and carry it back up. An interglactic removalist service? Most peculiar. Despite the air of grandiosity all Cirque productions have hovering over them, Totem also manages to find some moments of simplicity and they resonate most strongly. Eric Hernandez’s hoop dance has strength and integrity: it is more than a circus act. The fixed trapeze act for Sarah Tessier and Guilhem Cauchois is a beautifully choreographed and sweetly enacted pas de deux for young lovers while roller-skaters Denise Garcia-Sorta and Massimiliano Medini offer a steamier, more hard-edged version of togetherness. There was a Native American vibe to Garcia-Sorta and Medini’s costumes for no logical reason but they looked fabulous in Kym Barrett’s designs, as did the unicyclists and the 10 men in the gasp-inducing Russian bars finale, in which men are flung high into the air so they may twist and somersault at their leisure. This was man attempting to escape earth’s surly bonds and coming pretty close. On the debit side the music is live but sounds canned, the lyrics are nonsensical and the clowns aren’t funny. But then that’s the Cirque way. After all these years of global triumph why would they change the formula? After the Sydney season Totem runs in Melbourne from January 21, Brisbane from April 10, Adelaide from June 11 and Perth from July 31. A version of this review appeared in The Australian on October 30. SO there we all were, crammed tightly together in a small tent, perched on narrow, bum-numbing benches, laughing as if there were no tomorrow. It was instantaneous, delirious transport, the kind that sweeps away every thought except one: I’m here and I’m happy; there is no other moment but now. La Cucina dell’Arte is theatre of delicious, involuntary reaction. There are no mental gymnastics to go through, no sense that you’re missing something everyone else gets, nothing to bone up on or feel superior about. There’s no humiliation and nothing that offends. Just the pure, sweet, inclusive balm of laughter. Such theatre is simultaneously simplicity itself and highly considered and sophisticated. In this show, two blokes with a few props and a deep understanding of classical comedy manoeuvre their way towards the preparation of pizza for a couple enlisted from the audience. Naturally, what can go wrong will go wrong. Despite their names and the name of their production, Danny and David Ronaldo are not of Italian stock – their father, part of a long-standing Flemish circus dynasty, came up with the Ronaldo name – but they are steeped in the popular performance style known as commedia dell’arte. It was born in 16th century Italy and has been influential ever since. Anyone who has seen the comedy One Man, Two Guvnors can attest to its imperishable joys, and indeed there’s some connection between La Cucina dell’Arte and the British hit that will soon tour Australia, as both have been influenced by the great 18th century Italian playwright Carlo Goldoni. La Cucina dell’Arte is on a much more intimate scale than One Man and at just 70 minutes is wonderfully suitable for children. The show starts gently as Danny Ronaldo attempts to illuminate the tent and ends in near anarchy as he tries to keep things from spinning out of control – in this case literally, as plates are whirled around on an ever-increasing number of flexible poles. David Ronaldo is the genial but firm master, ostensibly running a restaurant but there to exert control over his wayward servant and on us. There are tricks involving sleight of hand, juggling, balance and co-ordination, although very likely never seen quite this way. Danny Ronaldo’s pizza dough handling is a thing of exceptional skill, grace and beauty; as it gets ever more elaborate it is also howlingly funny. You can’t say fairer than that.